Most shelves or drawers are unadorned, with smooth, bare surfaces devoid of color or interest. 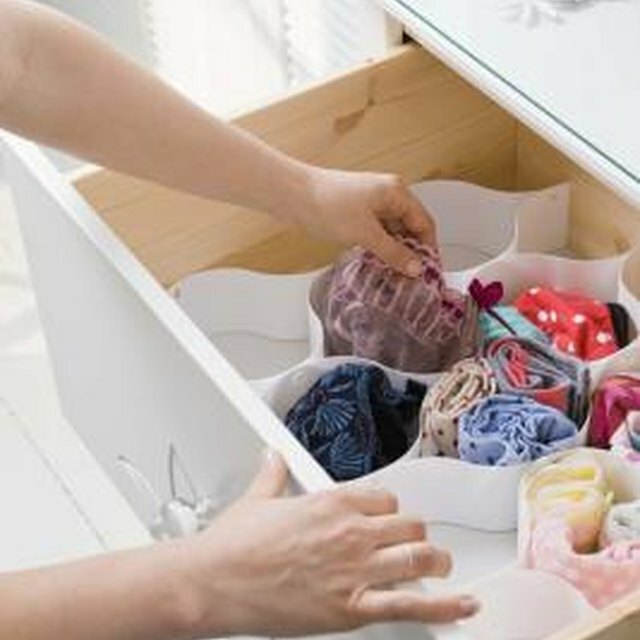 You can easily beautify your storage by adding an attractively-patterned paper or fabric liner to the bottom or sides, turning boring into stylish in only a few minutes. Once you've removed the contents of your shelves or drawers it's a simple process of measuring, cutting and gluing. A colorful liner can brighten up an otherwise drab drawer. Measure the interior dimensions of your shelf or drawer. You'll need to know the exact width and length of every surface you intend to line. Cut a piece of wrapping paper or fabric to the size you measured. If you're planning on lining the sides of the drawer or shelf as well as the bottom, cut additional pieces to those sizes as well. Apply an even coat of glue to the entire surface of the shelf or drawer using a sponge brush. Set the liner in place, working carefully from one side to the other. Ensure that the corners of the liner are in position with the corners of the surface. Use a bone folder or other hard-edged tool to smooth out any wrinkles or air bubbles that have formed. Work these out quickly, before the glue dries. Ask at your local home improvement store if they know when they will be closing out a line of wallpaper. The deals are awesome! As with any project, start with clean surfaces, vacumn and wipe shelves with an all purpose cleaner prior to laying paper.